Just think if ten was really fifteen or twenty people? Together, we donate a little and watch it go a long way, enriching everyone’s experience at the art center. You can enter any amount you’d like to contribute in the box at right, recommended amounts are listed in Fund descriptions. The Santa Cruz Mountains Art Center is a 501 (c) 3 non-profit community benefit organization and donations are tax deductible. You will receive a thank you letter from the Santa Cruz Mountains Art Center for your contribution, with our tax ID# for tax purposes. 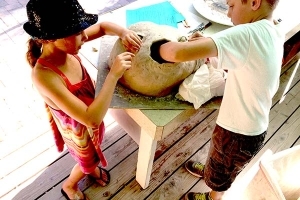 The Santa Cruz Mountains Art Center is committed to providing youth arts programs and supporting the development of individual artists art education through scholarship programs. In honor of Gloria Seneres, contributions made to this program directly support our Art After School program. The Art After School Program reaches kids at Boulder Creek, Bonny Doon, and San Lorenzo elementary schools, San Lorenzo Valley Middle School, and Scotts Valley Middle School. We recommend a minimum contribution of $25. There are a number of ways to donate to the Santa Cruz Mountains Art Center Youth Art Scholarship program. One is by shopping at New Leaf Markets on our annual Community Day. For every dollar spent at New Leaf Markets in Felton and Boulder Creek on Community Day, a percentage is donated to the Santa Cruz Mountains Art Center Youth Art Scholarship Program. In June of 2014, over $2300 was collected to support young artists in the community. Or contribute directly to our Youth Scholarship Fund, and support a young budding artist in our community. Support an Art After School student for $30, an Art Camp student for $150. Any amount helps. Together we make a difference! Facilities and equipment are always in need of repair and upgrades. Donations to the General Fund quite literally keep a roof over our heads so we can focus our energy on providing quality classes, exhibits, and community space to the public in an environment where everything works. We established this fund to support those in our volunteer force for whom the cost of a membership or class presents a financial hardship. Donations can be made on behalf of a specified individual in the amount of a year’s membership or cost of a class. In the case of unspecified donations to the Generosity Fund, the Board of Directors will choose recipients. Donations of computer equipment, art supplies etc., are considered on a needs basis. Please contact Susan Archibald to discuss the item(s) you’d like to donate.